Let me start out by saying.. I am very impressed. This microphone is truly something else. You get an amazing classic Neumann sound from this tiny little bodied mic, easy to travel with and never a hassle to hook up. Absolutely great on both male and female vocals if you like the “U87” sonic flavor which is imprinted on so many top hit recordings of the past 40 some years (higher compression). Marry it to a Grace M101 preamp (for clarity and soul) or an API 512C (for in-your-face rock and banging hip-hop) and your recordings will have that “big studio” magic that many pay $10,000 to achieve in your own home studio.. Hard to believe you can now get a real Neumann for such an affordable price. Especially if it can be delivered to your door in under a week! We love ours in the studio so far and it was most likely be staying here for awhile. Maybe until the “next big thing”. But for now this is THE best microphone for rap and pretty much any genre you need crisp vocals for. This mic has been declared one of the best for home studio hip-hop recording for beginners, at a great price point. Perfect for someone starting their own home studio or wanting to get serious about their rap career. Our artists could hear the difference within the first mix, and by no means are they trained engineers. 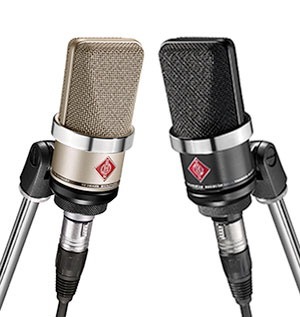 Once more – the TLM102 gives you the classic Neumann sound for a cheaper price and if that’s what you like, then you’ll love this mic. Amazon is hosting a great deal on these babies right now, click on the picture above or on the link below.